Originally published in Creation 26, no 3 (June 2004): 21-23. Numerous books have been written to try to explain what seems to be an irreconcilable problem—Christianity’s claim of a God of love in the face of the evil, death, suffering in this world. How could a loving God allow it? Numerous books have been written to try to explain what seems on the surface to be an irreconcilable problem—Christianity’s claim of a God of love in the face of the evil, death, suffering and disease in this world. In reality, evil is actually a problem for the non-Christian—not the consistent Christian—but first we must understand the origin of evil in this world. Shown here is the mangled wreck in which AiG’s Dr Carl Wieland was seriously injured in 1986. 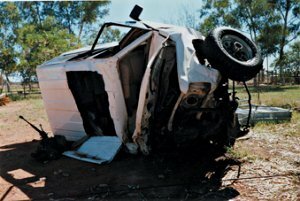 He lay trapped inside for 5.5 hours after a head-on collision at highway speeds with a fully laden fuel tanker in the Australian outback. 56 surgical operations followed over the next seven years. The book Walking through Shadows has details of his personal trauma, with fascinating and “different” insights into healing, and especially the powerful way in which his creation-based understanding of the Bible’s “big picture” made all the difference in how he coped. This unique book, which includes Ken Ham’s moving account of his brother’s progressive and fatal brain disease, has been of incredible help to countless Christians who are having trouble understanding their, or their loved ones’, suffering. My heart went out to this grieving family. What would I say to them if I had the opportunity? I recalled the death of my younger brother over a year ago (see box, right). And yes, I still grieve, but at the same time, a correct understanding of the origin of death is important in dealing with such a tragedy. The first man, Adam, represented the entire human race. When he sinned (rebelled against God, by disobeying His clear Word of instruction) he told God in essence that he wanted life without God. He (and thus we) wanted autonomy—to be independent of God. Now if God gave us what we really asked for in Adam, we wouldn’t even exist, as He holds all things together by the power of His Word ( Colossians 1:15–17 ). As a righteous God, He had to judge rebellion—He judged sin with death (spiritual and physical). God cursed the ground—the whole of creation now groans because of sin ( Genesis 3:17–19 , Romans 8:20–22 ). God has obviously withdrawn some of His sustaining power, so that He does not uphold everything together perfectly as was the case before the Fall. Now everything groans—tends to run down or fall apart. We actually live in a world where we have a taste of what life is like without God—mutations, death, suffering, evil, etc. However, when one understands the reason for death, suffering and evil in this world (by understanding the origin of such things as recorded in Genesis), one realizes it’s not God’s fault the world is this way, but our fault. And really, everyone suffers—everyone will die physically, not just that dear baby. What happened to that baby will happen to every one of us (unless the Lord returns before that time). The Fall, as recorded in Genesis, explains the origin of evil, death and suffering in this world and enables us to correctly place the blame on ourselves. Now, secondly, we need to reconcile how an all-powerful and all-loving God would allow evil, suffering and death (like the death of that precious baby) in this world. If God is powerful enough to overcome evil, and if He is all-loving—surely He would want to do this? If God is powerful enough to overcome evil, and if He is all-loving—surely He would want to do this? If “good” is what gains public approval, then it is ultimately just an opinion. Without an absolute authority who has a right to determine “good” and “bad” (“right” and “wrong”), then what is “good” is just subjective. Who determines whose definition of “good” is correct, ultimately? Thus, an unbeliever’s definitions of “good” and “evil” are subjective and his morality ultimately relative. So, logically, how can such a person make an accusation that the existence of a powerful and all-loving God is inconsistent with what this person determines is “evil” in this world? Now an unbeliever might still claim that the paradox (of evil and an omnipotent, loving God) exists within the Christian worldview (where good and evil are real). However, there is a logical answer to this challenge. The events of the crucifixion were evil—but for a morally good purpose—the salvation of man. “This man was handed over to you by God’s set purpose and foreknowledge; and you, with the help of wicked men, put him to death by nailing him to the cross. But God raised him from the dead, freeing him from the agony of death, because it was impossible for death to keep its hold on him” (Acts 2:23–24). There are many other events in the Bible we can now look back upon and understand their morally good purpose. But at the time they didn’t make sense to fallible humans, given that God is all-loving and powerful ( Romans 8:28 ). Job’s suffering at the time seemed irreconcilable with a loving God (just as the death of that precious baby mentioned above seems to be). However, not only did God remind Job that he (Job) hadn’t always been there (humans are not omnitemporal) and didn’t know everything (humans are not omniscient), God commended Job for his faith. And Job learned that there was much more behind what happened to him for a morally good reason that would teach important lessons to millions of people through the ages. Death is properly called the “last enemy” in the Bible ( 1 Corinthians 15:26 ). But in a strange way, in the context of the Fall, it is also a blessing for mankind, ultimately—since without it, humanity would have had no way of reconciliation with God, and we would all have remained separated from God for eternity. Here’s the bottom line for all such issues, not just the problem of evil. Do we put our faith in the Word of an all-powerful God, who knows everything and has always been there? Or do we place our faith in the words of fallible humans who don’t know everything, who haven’t always been there, and accept their subjective human thinking and values? C.S. Lewis in The Great Divorce said that those in Hell will to be there, and would be worse off in God’s holy presence as unrepentants. Others have pointed out that the seriousness of sin depends on the one sinned against. A sin against the infinite God deserves infinite punishment. Bahnsen, G.L., Always Ready—directions for defending the faith, Covenant Media Press, Texas, USA, p. 169, 2002. Bahnsen, G.L., Always Ready—directions for defending the faith, pp. 171–172.